Kids Glued to Screens? Check Out How Much of Screen Time is Good! Children today are far more exposed to technology than ever before in history. Up until a generation ago, they only had one TV in living room running a limited set of serials in a day or a week. Today, they have a personal TV in their bedroom, a computer or a laptop, an iPad and a smartphone all at their disposal. That’s an awful lot of screens to stare at and huge amount of time to turn them into couch potatoes while they interact with their gadgets. A lot of parents believe that technology and gadgets are also important for their child’s development. While it is true that these gadgets do carry some good content to educate your child, the question remains, how far can you let them go? Parents of younger children use these gadgets to keep the young children engaged, so that these children stay out of trouble, or don’t disturb their parents. Children play video games, surf the internet and when they find something interesting, they remain lost in it for hours. While, this may be an easy way out, the same question remains, how much is too much? 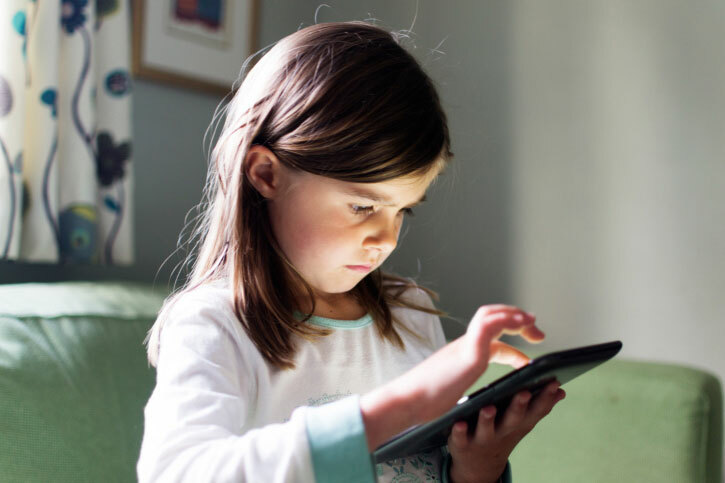 We have to understand the impact of letting children spend too much time on screen on various levels such as physical, psychological and social. Spending too much time sitting or lying down in one position, without much movement, is definitely not healthy specially at an age when they should be running around and building their motor skills. It is common knowledge that a sedentary child is not a healthy child. The screens today might have become better and may be emitting lesser radiations but continuously gazing a small screen, for long hours, does take its toll on eyes. Also, sitting in unnatural poses with neck bent down for long hours is sure to cause bigger health issues. Further, watching TV, videos or playing games on tablet is essentially a solo activity. There is almost no interaction with any other person. This means the child engaged in these activities does not get to develop his social skills. Man is a social animal and thus engaging with society is vital for any human to lead a normal healthy life. The more time kids spend on TV or smartphones, the less they interact with other people and the more they lose their vital social skills. The most effective way to avoid these physical, mental and social health hazards is to exercise, play and spend more time away from the screens. Most of the doctors recommend no more than one to two hours a day in front of any kind of screen. This includes TV, tablets, smartphones or any other form that your kid is exposed to. While, this may not really be practical for everyone, parents should ensure that the child is devoting equal time for all other activities like playing, running, exercising, spending good time with family and friends. It’s important that child realizes that the real world is not behind that screen but out there in their homes, playgrounds and with family and friends. Don’t be worried about your expensive Smartphone, Buy syncNscan and be free from any kind of damages & breakages.